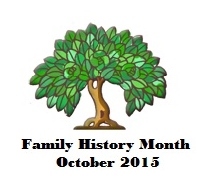 The United States celebrates Family History Month in October every year. It is a wonderful time of the year; summer activities have waned and Fall leads to being able to spend more time inside. Many libraries and societies are participating in Family History Month by offering classes, webinars, events, and more to explore. It is a time to celebrate our roots. 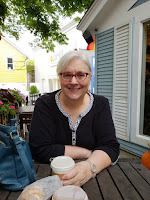 I plan to celebrate and take advantage of some of the online Family History events and refocus my attention on family history. Two great Family History Month events are below. Do you have a favorite Family History Month event? Please share in the comment section. 1. Heritage Quest is offering two webinars: Introduction to Heritage Quest and Heritage Quest-Beyond the Basics. The following information is courtesy of Library of Michigan. Did you know that HeritageQuest Online is now powered by Ancestry.com? Join us for this course which will cover tips for using HeritageQuest for family history projects, new search pages for the U.S. Federal Census records from 1790-1940, more than 28,000 family and local history books, Revolutionary War and Freedman's Bank collections, and the U.S Serial Set of action of the U.S Congress. Join a ProQuest Training & Consulting Partner to walk you through all of the exciting features. Join a ProQuest Training & Consulting Partner to learn specific search strategies for many of the major collections in HeritageQuest, especially the Census, the Books, the Revolutionary War records and the Freedman’s Bank Records. This 60-minute session is packed with information about each of these collections and tips for searching them. Other collections will be explored if time allows. Also, the page you access when visiting this link is our standard registration page. On the top left side of the page (next to Event Status), you will find the registration link for each webinar. After registering, participants will receive an email with meeting access information and the meeting password. Registrants will also receive two additional reminders - one two days before the webinar and one two hours before the webinar. 2. National Archives and Records Adminstration (NARA) will be offering their National Archives Virtual Genealogy Fair, October 20 and 21st. The following is from the National Archives Event page on their website. Participate in our biggest genealogy event of the year! During the two days of live Internet broadcasting, learn and ask questions about Federal records as resources for family history research. Speakers include genealogy experts from National Archives facilities across the nation. From beginner to expert, discover new tips and tricks—we have sessions for all skill levels. After the event, recorded sessions and handouts will remain online. Learn more at www.archives.gov/calendar/genealogy-fair.